Bio Blis K12 a unique, one-of-a-kind probiotic product designated for maintaining oral, throat and ears cavities health. The product is based on a patent, friendly bacterium called BLIS k12 which operates primarily within the oral cavity. A registered patent of Blis Technologies Ltd. Indications and usage: 1-2 lozenges a day. 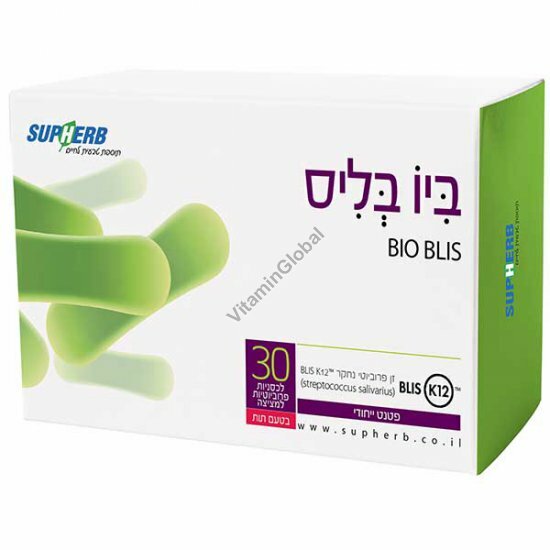 Recomended in combination with: Garlic capsules , Vitamin D-400 . Available in bottles containing 30 lozenges. This product is not a medicine and is not intended to replace medical treatment. The information above is not controlled by the Ministry of Health.